Last week I attended the Military Operations Research Society 83rd annual symposium in Alexandria, VA. MORS has a full working group and conference track devoted to wargaming, and many other panels and tracks of interest to national security analysts. Unfortunately, MORS also has a very uneven record with regard to the participation of non-American nationals. For many years it was NOFORNed entirely, meaning that while any American registered for the conference could attend any unclassified session, non-Americans couldn’t participate at all (even if they were from allied countries and held security clearances). Last year the procedure changed, and the majority of sessions were opened to FVEY (UK, Canada, Australia, New Zealand) participants—including almost all of the WG30 (wargaming) sessions. This year, however, almost all of the wargaming sessions were not held in the Hilton as in 2014, but rather at the Department of Defense’s nearby Mark Conference Center. While most of these were unclassified, non-Americans had to submit site visit requests well in advance of the conference through their embassies to even access the building. For those attending on official business this was an irritating, but achievable, process. However, FVEY embassies aren’t in the business of processing for paperwork for academics or others attending MORS in a non-government capacity (even if they do hold security clearances). 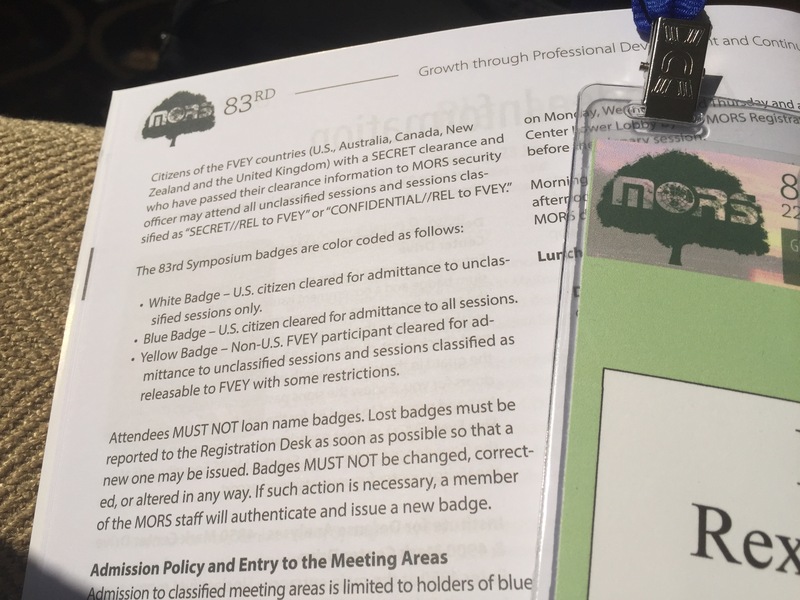 The MORS misfit Green Badge of Death, so reviled it isn’t even mentioned in the conference program. The net result was I received a Green Badge of Death, severely limiting the panels I could attend. Indeed my own session had to be specially moved to the Hilton so that I could deliver my presentation. Equally unfortunately, the coffee and snacks were in the Mark Center too, resulting in severe caffeine withdrawal. 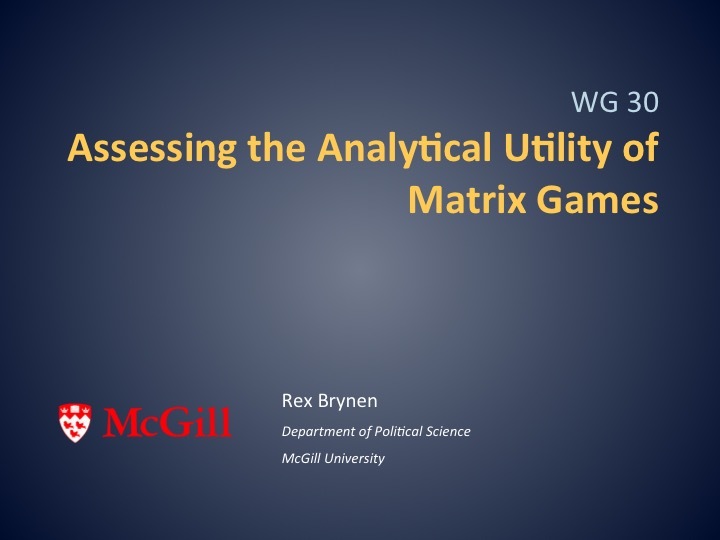 My own presentation summarized work that Ben Taylor and I have been doing on matrix gaming. We were severely tempted to make it Canadian Eyes Only. 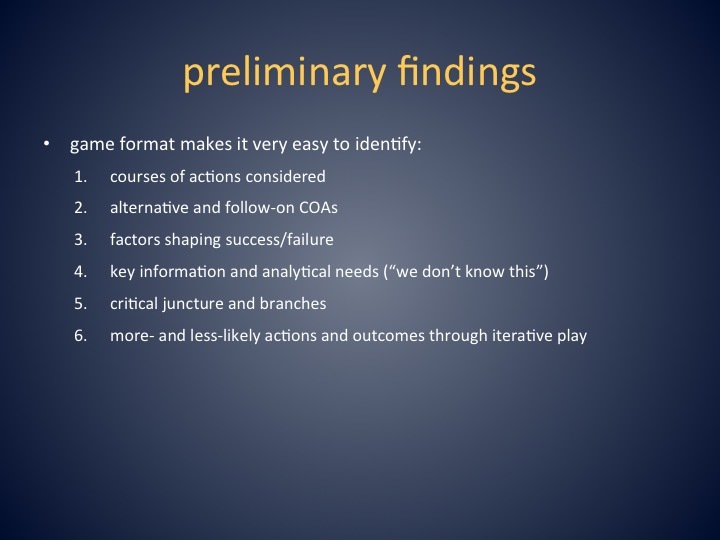 You’ll find the full slide presentation here. Ben and I also ran a shorter version of the “ISIS Crisis” matrix game. This saw the Iraqi government successfully push through legislation to establish a new (Sunni) National Guard in the face of parliamentary opposition. While this antagonized some hardline Shi’ite militias, US advisors did make progress in training Sunni tribal volunteers. ISIS conducted some probing attacks around Tikrit (where a number of sectarian atrocities occurred on both sides), an unsuccessful surprise attack on a newly-established National Guard training base, and then—in response to an overconfident YPG attack in Syria, unleashed a counteroffensive that drove the Kurds out of Kobane and seized much of the area around Hassakeh. Little did we know that—at the very time we were gaming—ISIS had done much the same in real life, (temporarily) infiltrating Kobane and launching attacks in the Hassakeh area. I was also able to take part in the WG30 “Drive on Metz” wargame. 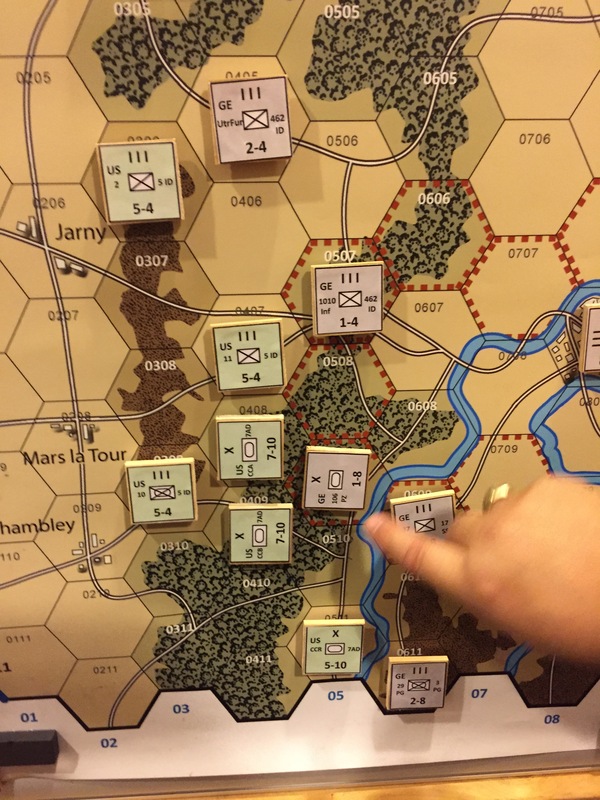 The game—designed by Jim Dunnigan and included in the first edition of The Complete Wargames Handbook (1980)—depicts efforts by General Patton and three divisions of the American 20th Corps to seize the city of Metz and cross the Moselle River before the retreating Germans can form an effective defence. Three games were held simultaneously, with the US and German players in separate rooms. I was happily coopted into the CNA dream team consisting of E.D. McGrady and Peter Perla, playing the German defenders. The 106th Panzer Brigade locks down much of the US 7th Armoured Division in its magical ZOC while refusing to die. The purpose of the games was not, it should be stressed, to teach participants how to play wargames. Instead the exercise was really about how to document and analyze them. Accordingly, several teams were assigned to track and assess each game, each using a different methodology. The games were also recorded in SWIFT (Standard Wargame Integration Facilitation Tool) software for subsequent playback and analysis. Unfortunately, the computers set up in each room proved unable to talk to each other, meaning that each move had to be laboriously recorded in one room, then the magnetic map board need to be carried into another to also be recorded there. The result was that it took 5 minutes or less to make each move, and 15 minutes or more to document it. I am also unconvinced that Drive on Metz is a very good game for this purpose. There are no supply requirements, and no step losses. It uses locking zones of control (meaning that once adjacent to an enemy unit you can no longer leave), and the combat results table only allows for retreats, never losses due to combat or attrition. As a result, the game largely involves pinning units and trying to maintain a safe line of retreat, with even foot infantry able to safely retired from massed armour assaults if they leave a path open. Ironically, since the rules permit no stacking, a defence in depth means you are more likely to die since you cannot retreat on top of a friendly unit. Because of the way locking ZOCs work, through most of the game we were better to guard the Moselle by leaving sections of the river unguarded, thus preventing the Americans from crossing it through advance after combat. Overall it is a simple, but rather gamey, system that doesn’t represent ground combat (or highlight the value-added of wargaming) particularly well. On top of that, and despite having the players in different rooms, there was no fog-of-war. Instead we knew where every US unit was every time, thus failing to reproduce either the chaos of a rapid US advance/desperate German retreat or allied air superiority (and hence superior reconnaissance) in September 1944. 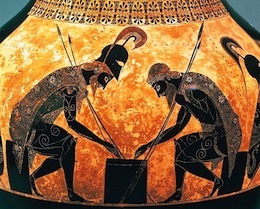 We would have been far better to have wargamed using proper double-blind play. I also think something like the Battle of Midway or the hunt for the Bismarck would have worked better, with lots of uncertainty, calculated risks, interesting choices, and difficult trade-offs. Since I couldn’t attend the later debrief in the Marks Center, I am also not sure how much the analysts could capture. In our case discussion was very quick and partially in “gamer speak” with a lot of finger pointing at hexes and retreat paths, followed by idle chatter as we waited for the move to be processed. German Player #1: If we move here [points at hex] the ZOC will pin these units [points at units], and we can retreat here or here [points at hexes]. German Player #2: Let me check the CRT. Even at +13 the most they can force is a DR2. German Player #3: Sounds good. All-in-all it was a good effort into which a great deal of work had been put, and the organizers certainly couldn’t be held responsible for most of the technical hiccups. However, I think a better game design would have served the purpose better. I had many very useful side-conversations at the conference. However, limited access meant that, overall, I found the MORS 83rd symposium disappointing. If MORS can’t find a way of making most of the unclassified programme readily accessible I won’t be attending the annual meeting again. Really folks, most of this stuff isn’t at all sensitive. I am, however, looking forward to the MORS Special Meeting on Professional Gaming, to be held in Fairfax, VA this fall. This will consist of a three day workshop (29 September – 1 October), plus an optional one day course (28 September) on professional gaming as an analytic practice. The meeting will produce initial content for a Professional Gaming Practioner’s Handbook and bring together members of the community of practice to consider best practices, design, existing applications, and appropriate analytical methodologies in an effort to codify the fundamentals of game design and analysis. 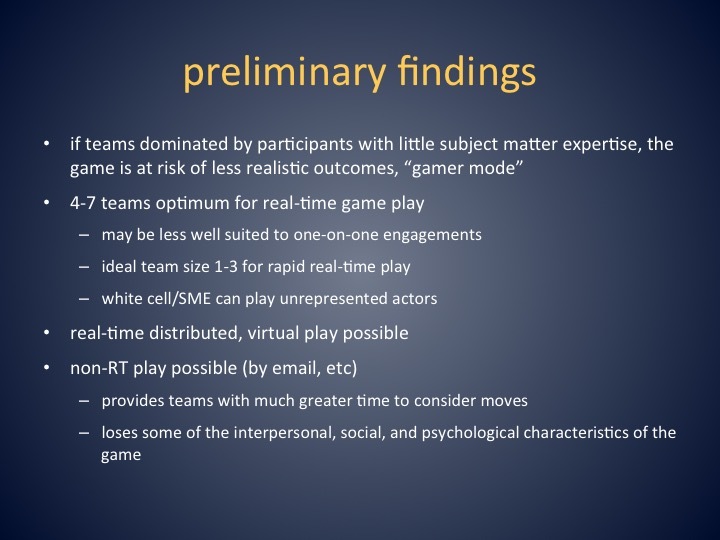 The meeting is intended for information exchange and participant exposure to professional practice—there is no intention to conduct a game or for attendees to participate in game play. I will be cochairing (with Rober Leonhard) WG8 of the meeting, which will augment the introductory course with practical, hands-on exposure to professional gaming practice. Participants in this group will design a professional game by applying the skills and best practices associated with other working groups. I’ll post more information to PAXsims when the meeting opens for registration. Thanks for the ongoing updates and sharing your work with us all. I always look forward to the next installment. In particular, I really enjoy your discussions on using Matrix games. Thank you. Thanks for the account of the symposium Rex. The last one I attended in person was in 2008, at the US Coast Guard Academy, and I didn’t even get as far as a Green Badge of Death. But it looks as if we will be working together in WG 8 at the Special Meeting, which is unclassified and open to foreigners. Looking forward to that! We really need to print up some “dangerous foreigner” t-shirts. 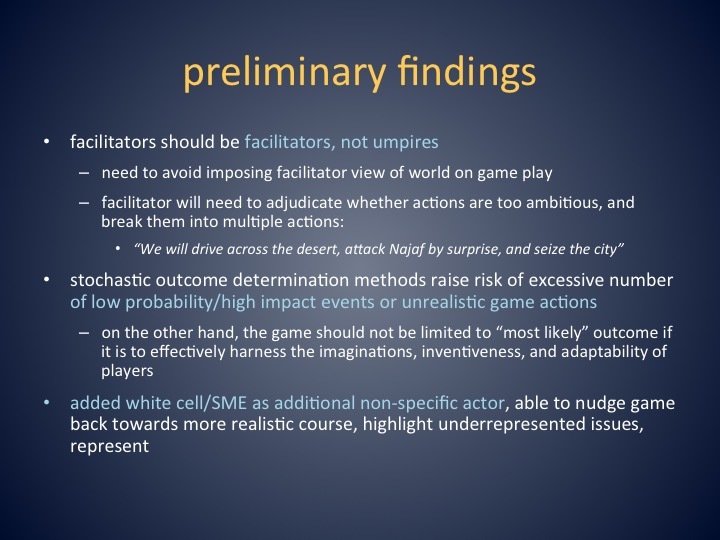 Thanks for the Matrix Game presentation – most helpful – the point about “Facilitator” vs “Umpire” is particularly well made. I have just run a game on the Cyber Operational Awareness Course at the DA, so I hope to be able to provide a write-up as soon as I have had the feedback returned. 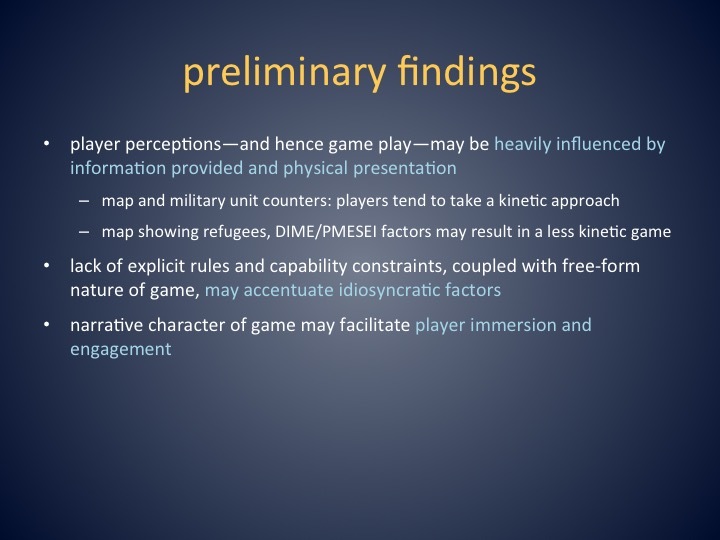 Your observation about player perceptions (map/military counters vs map/DIME/PMESEI) are backed up here and deliberately exploited to bring out educational points. As for “dangerous foreigner” t-shirts: how about “YESFORN” (as oppose to NOFORN)? I like that Tom, I like that a lot!